Call Record NOW: Call Recorder App for iPhone. Record any call on your iPhone. Unlimited free 7 day trial. Call Recorder App for iPhone. Record any call on your iPhone. Unlimited free 7 day trial. What can I use Call Record NOW for? The Call Record NOW app allows you to record any call you place or receive on your iPhone. Simply download the app, configure it in less than a minute, and you’re ready to record phone calls. 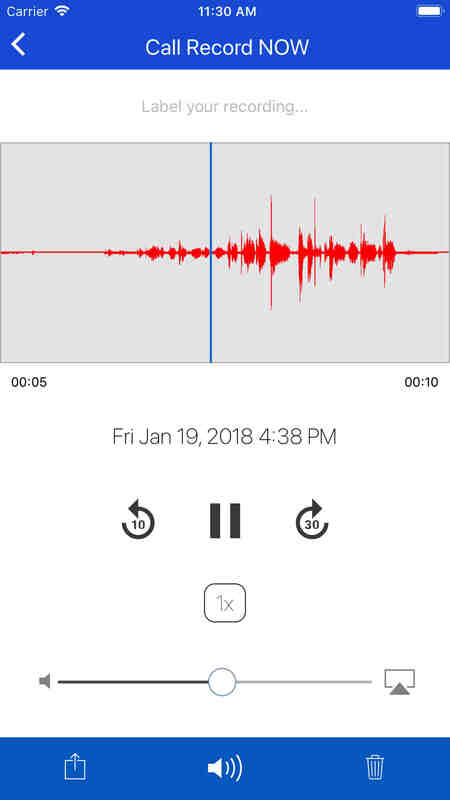 After you’ve recorded a call, you can view, playback and share the recording from within the app. 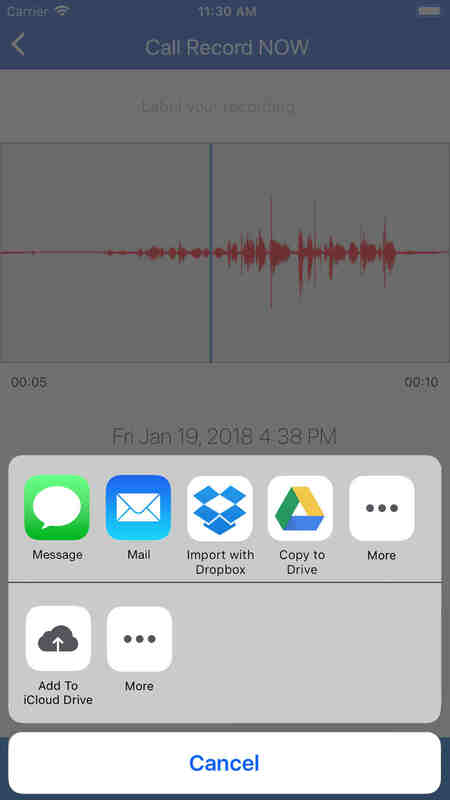 Recording a call using our app is simple and uses the conference calling feature on your iPhone to conference a call you make or receive, and want to record, with our recording call-in number. 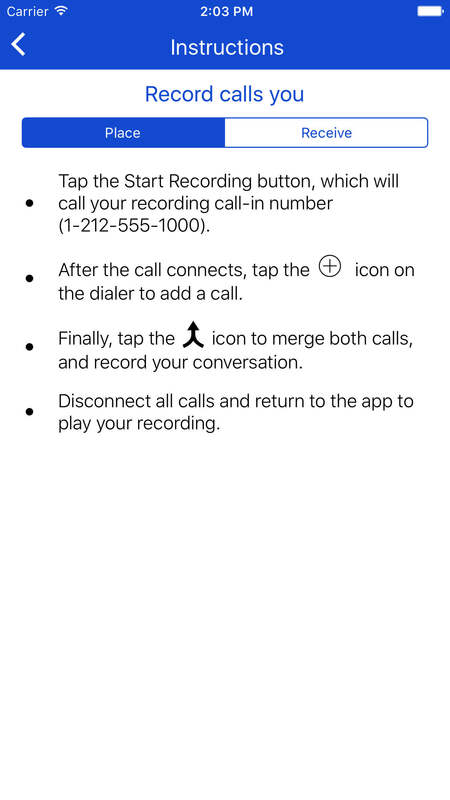 See the screenshots at the top of this page for detailed instructions on how to record a call you place or receive from your iPhone. 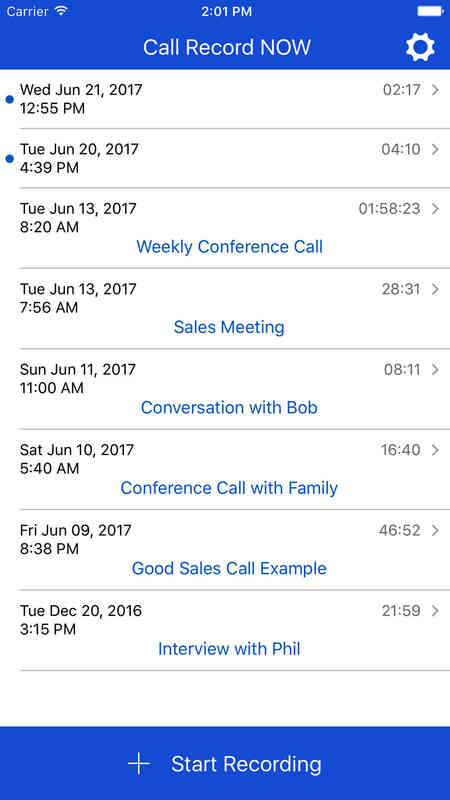 Are there any limits to the recorded calls? Nope! You can record as many calls as you want, and each call can be as long as you need. How do I play and share recordings? There are no limits within the free trial. After the free trial has expired, you can still make new call recordings, but you won’t be able to playback any recordings made after the free trial expired, unless you are subscribed to the paid service. Subscriptions are available within the app. How much does Call Record NOW cost? The app is free to try for 7 days and includes all the functionality in the paid version. The free trial has full functionality, and isn’t crippled in any way. Pricing is shown within the app for the paid version, which is available in 1 month or 1 year subscriptions, and can be purchased in-app using your iTunes account. The paid version includes all the same functionality as you get during the free trial, and includes unlimited recordings, playbacks, and sharing of recorded messages during your subscription period. Is there a per-minute or other costs? Nope! No per-minute fees and no credits / coin purchases required. Whether you’re using the free trial, or the paid subscription, you can make, playback, and share unlimited recordings. PLEASE NOTE: Once you delete a recording from the app, it cannot be recovered. You should use the share feature to save any recording you want to keep, before deleting it. Share any recordings you want to keep. This can be done by any share method, such as emailing it yourself, or placing it in a storage service like iCloud Drive, Google Drive, Dropbox, etc. PLEASE NOTE: You must open the app to download recordings. Recordings that aren’t downloaded from our server within 30 days of the recording date are deleted from our server and will not be accessible. Where are the recording call-in numbers? Our recording call-in numbers are located in the United States and Canada. If your cellular service includes unlimited minutes to the United States or Canada, the calls to our recording server are free. If your cellular service charges for calls on a per-minute basis, you’ll be charged at the same rate you are charged for any call to the United States or Canada. When do paid subscriptions renew? Paid subscriptions will automatically renew approximately 24 hours before the end of your subscription period (1 month or 1 year). I subscribed to the paid version, can I get a refund? Once you subscribe to our paid service, your subscription runs until it expires, which depends on whether you selected a monthly or yearly subscription. As we offer a free 7 day trial of our app and service, we don’t offer either partial or full refunds for subscriptions. I have a question or comment, who can I contact?